This was an unfamiliar wine when I saw it on the shelf at a local wine store. Since I had a coupon worth 20% off on “old world” wine and we always seem to be low on Italian wines, I had to grab a bottle. Since the bottle already had a couple years of age “under its belt”, I’m hoping it’s good to go. This wine is 90% Sangiovese, 5% Alicante, 5% Cabernet Sauvignon. The wine has 14.0% alcohol and the bottle is sealed with a natural cork. 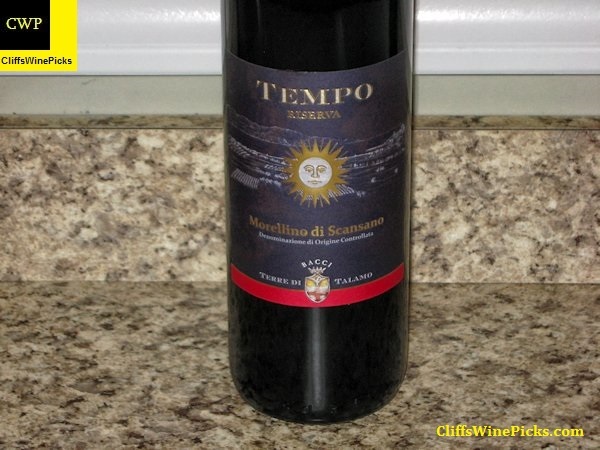 In July 2012, the store where we used to live brought this in at a great price, under $25 a bottle. Those bottles are long gone, but when I saw this on the shelf of a store near our new home, I had to grab a bottle even though the cost was not as low. 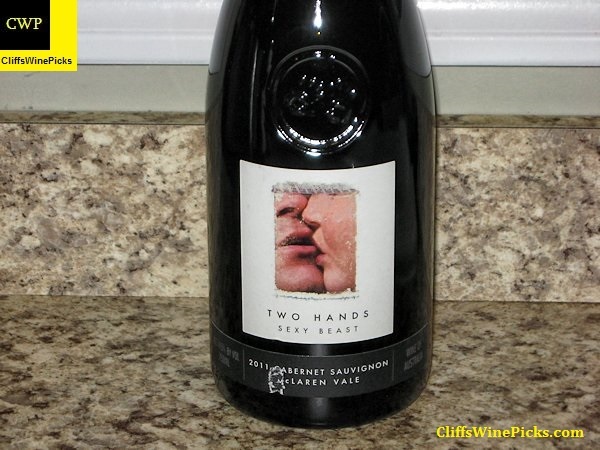 Two Hands is one of my wife’s favorite wineries so it was nice to open something I knew she would appreciate. Gnarly Dudes is made with fruit sourced from mature vineyards from the Barossa’s western ranges. This wine has 14.8% alcohol and the bottle is sealed with a twist off cap. 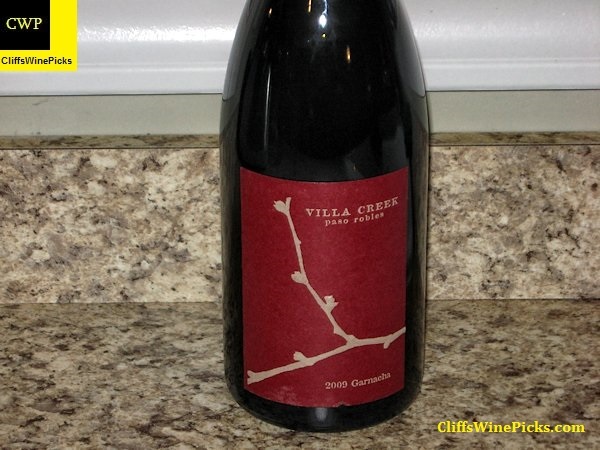 This wine is 100% Grenache from the Denner Vineyard in Paso Robles. This is the first year Villa Creek used concrete vats for a portion of the Grenache, which was fermented with 50% whole clusters. The other two lots were fermented in steel and aged in 500 liter barrels, 50% new. 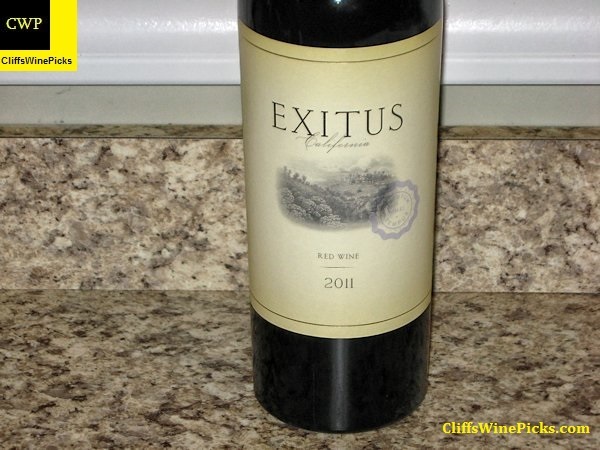 The wine has 15.2% alcohol and the bottle is sealed with a natural cork with wax coating. There were 360 cases produced. 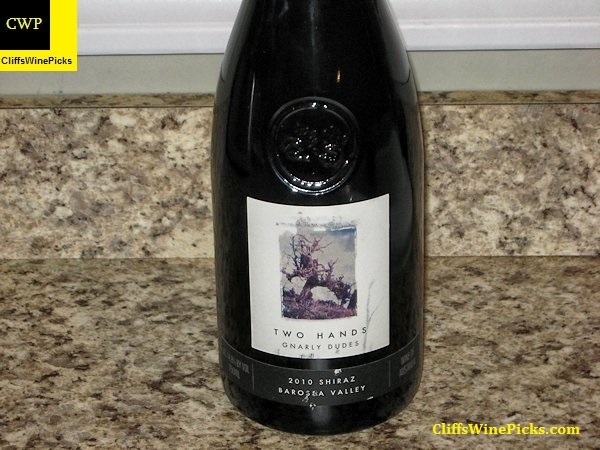 Two Hands is one of my wife’s favorite wineries so I have to grab a bottle or two any time I see them on a store’s shelf. I bought this bottle at the same time I grabbed the Gnarly Dudes also on this post. This wine is 100% Cabernet Sauvignon from Australia’s McLaren Vale region. The lots that went into this wine were crushed into and fermented in open top vessels. There were three daily pump overs to extract flavors, color and tannins. The average time ‘on skins’ was 14 days. The batches were then drained and pressed to tank and then racked to barrel for oak maturation. The wine was aged 14 months in hogsheads: 12% new French oak, balance in one to four year old French oak. This wine has 14.5% alcohol and the bottle is sealed with a twist off cap. The wine has 13.5% alcohol by volume and the bottle was sealed with an artificial cork. 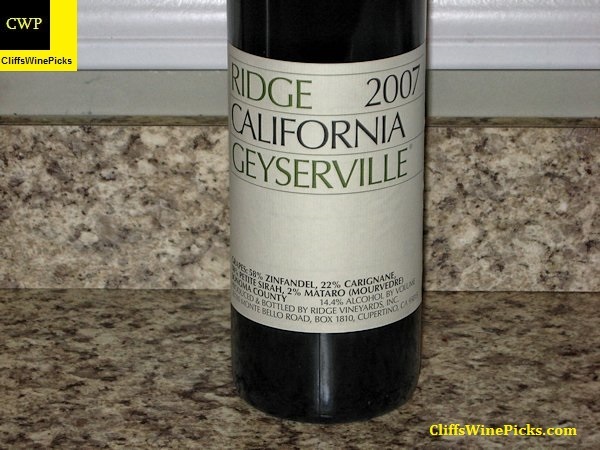 I decided to try something different to pair with the Ridge Geyserville. I have a pellet grill that I use to smoke meat and decided to see how a chicken would turn out. I started with a five to six pound whole fryer. 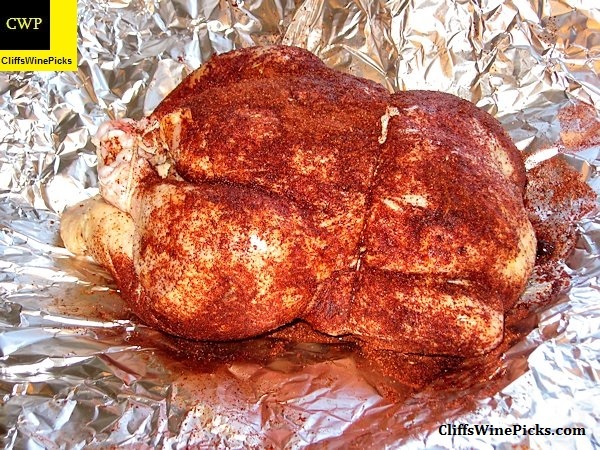 After brining it overnight in water with kosher salt and brown sugar, I rinsed it off with cold water, patted it dry and coated it with my spice rub. 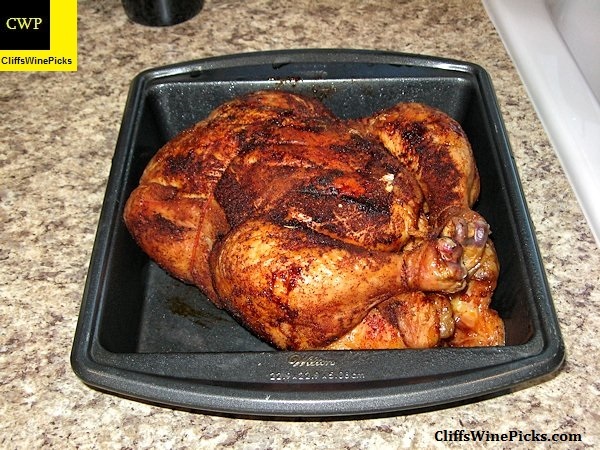 The bird then went into the pellet grill for 6 hours at 180 degrees. For the last hour, I upped the temperature to 225. Here is the finished chicken. It was very tender and extremely juicy with just a touch of spice from the dry rub and it had a very nice smoky aroma and taste. The chick and the wine worked very nicely together. Hello from stormy NH! When you get a lemon (Our second snow storm in a week) it’s time to make lemon aide. Geyerserville is one of my favorite wines; my first was the 2008 which was 72% Zin, but the 2011 is (was) 78% Zin, and just maybe one of the best Zins I ‘ve tasted.